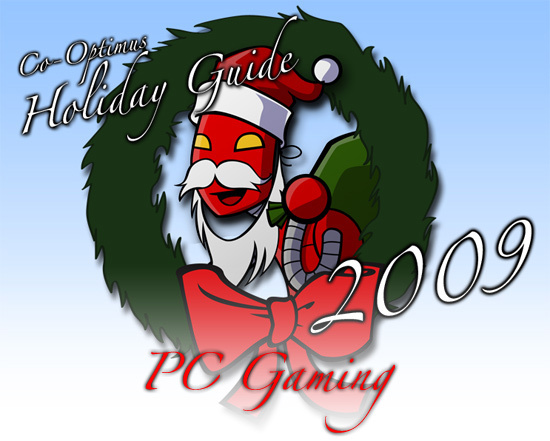 Gearing up for the holidays, Co-Optimus presents the PC version of our co-op holiday gift guide. This guide is designed to help select the best PC co-op titles and hardware for the various types of gamers on your list. In these trying economic times, it's hard to pick just one game to buy at full price, so why not get a ton of co-op goodness for the price of a single retail game? From now until Monday, Steam's offering a substantial package of THQ's games for $49. With titles like Dawn of War II, Company of Heroes: Tales of Valor, Titan Quest, Saint's Row 2 and Full Spectrum Warrior, you'll be rocking co-op for a good long while. Though there aren't any co-op titles in this package (unless you take Jason's route), Lucasarts' PC heritage is impossible to ignore. With a good selection of classic adventure games and most of the top-tier Star Wars titles, you'd be foolish to pass this one up. Left 4 Dead 2 is fantastic, and the PC version is the best way to play it. If you're rounding up buddies to play it with you, might I suggest spreading the love with the 4-pack? Nothing says friendship like slaughtering the infected with three of your best pals. Zombies are great, but what about that "other" 4-player shooter that everyone knows and loves? The PC version of Borderlands has a few issues, but once you tweak it, it's a completely awesome co-op experience, and Amazon's currently selling it for $19.99! Anyone who even thinks they like Diablo-style games needs to get their hands on Torchlight. Though we're disappointed it doesn't contain co-op, this gem of a game provides a significant value for its $20 price point. Luckily, fans of this style of game can currently pick up both the regular and collector's editions of Sacred II, which DOES have co-op on Amazon for $20. Page created in 0.6979 seconds.